became popular in 1955, the nation learned to swing to a whole new sound. Prior to that the Big Band Era from the 40’s was still the the driving force in music. – just to mention the “Ps”. The feel-good innocence of a lot of the Fifties music reflects on the post World War II optimism in America. The young people of the time, an emerging force called teenagers, hadn’t struggled through the war years. They were looking for something more exciting. They discovered that vitality in Rock and Roll. During the Fifties both styles of music co-existed quite nicely. 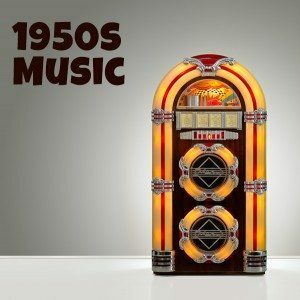 Some of the music you associate with the Fifties was actually recorded in the Sixties. Blue Moon, by the Marcels, for example. And all of the “girl groups” are from the 60’s. When you look at the dates, musically the styles tend to break off mid-decade. The tunes from ’55-’64 are pretty much alike. Things don’t change much until the British musical invasion of U.S. and the U.S. military invasion of Viet Nam, from around ’64-’74. This area of the site is subdivided as listed at left. There’s lots to see. For each year there is info and song lists. Then there’s Elvis, natch. The American Bandstand pages talk about the Regulars. The Day the Music Died gives an account of the plane crash that killed Buddy Holly, Ritchie Valens and the Bopper, plus an annotated American Pie. At The Hop relives those sock hops of years gone by. And drool a bit over those dreamy Teen Idols. Tap your feet and join in! The Day My Music DiedDue to a Cease and Desist letter from the Harry Fox Agency, all the Oldies music in midi format has been removed from this site. Also all Oldies lyrics. I am deeply saddened. Both the Patriotic Songs, Irish Tunes and Christmas Songs remain as they are public domain. And if not, I’m sure some damn lawyer will write to tell me about it.